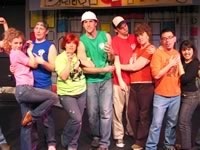 Driving down to see iO Theater’s late-night Breakfast Club: the Totally ’80s Musical, I tried to recall the salient features of that distant decade. Other than my own wedding and all the social, political and international goings-on summed up in the name Ronald Reagan, I couldn’t think of much. It was a fairly colorless era. However, this show isn’t a paean to the totality of the 1980s, but only a tiny portion of it: John Hughes’ 1985 teen-angst cult film "The Breakfast Club." 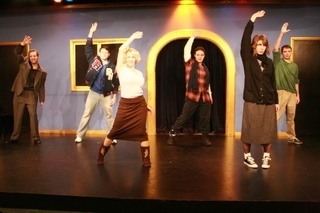 Set in Shermer High School, a fictional version of Hughes’ Northbrook alma mater, Glenbrook North, the show mixes dialog from the movie with nearly a dozen 1970s and ’80s songs performed by the cast in choreographed routines. 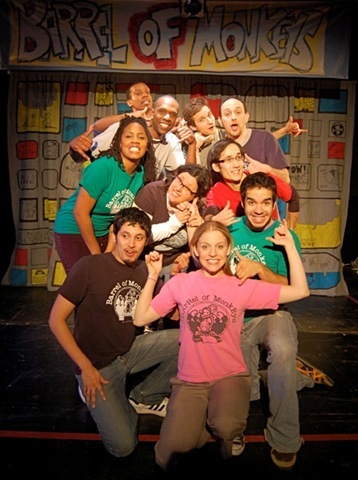 The film’s success lies in its combining the archetypes of high school: The Brain. The Jock. The Princess. The Basketcase. The Rebel. Whether you wore your hair shoulder length or in a mullet, dressed in tie-dye or bubble skirts, you knew them. This homage brings them back to life. 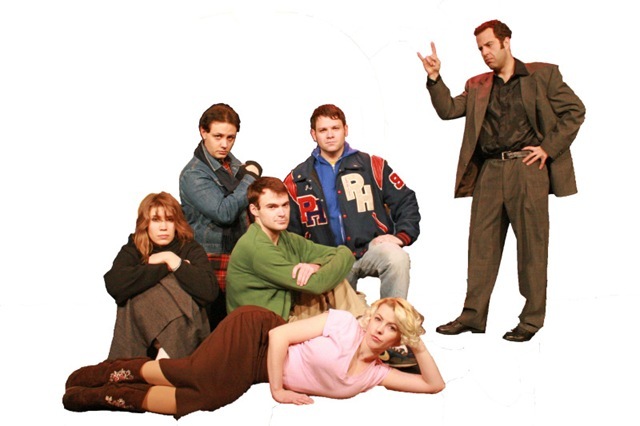 With Mark Lowe as Mr. Vernon; Tim Dunn as Brian Johnson, the Brain; Brian Finlay as Andy Clark, the Jock; Jessica Joy as Claire Standish, the Princess; Mary Cait Walthall as Allison Reynolds, the Basketcase; and Jeremiah Howe as John Bender, the Rebel; the cast re-enacts the Saturday when the five teens were unexpectedly stuck together for a day-long detention, punctuated by song and dance numbers set to the likes of Billy Idol’s "Rebel Yell" and Michael Jackson’s "Beat It." 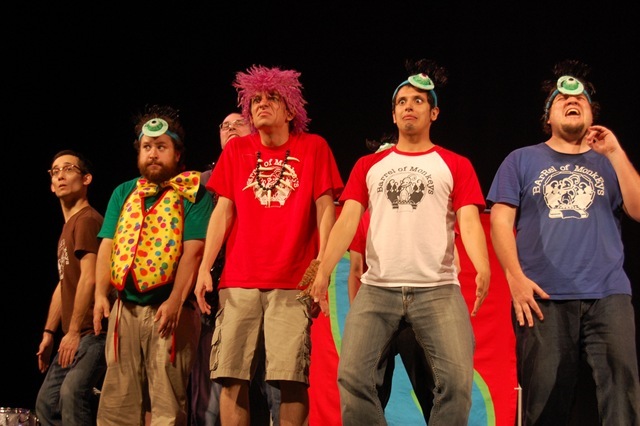 Although this kind of like a live-action version of a video on YouTube (where you can see a dozen such re-enactments created by actual high-school students, mixed in with homemade music videos featuring "The Breakfast Club" movie clips), the iO cast has undeniable talent. In some cases, I thought their characterizations were better than the originals — and good voices. Musical Director Seth Tucker and Michele Tucker ably accompany on guitar, drums and keyboards. Erica Reid and Jeff Gandy‘s jerky, self-conscious choreography imparts a good deal of the humor, coupled with the actors’ largely deadpan re-creations of the characters. Productions like this one are a reason I have trouble with rating systems. Lightweight and silly as it is, "Breakfast Club" is a sweet show, and if I were to rate it strictly on its own terms — just on what it’s trying to be — I’d give it four stars. But when I look at what four-star plays like "Awake and Sing" or "Out of Order" have invested in sets and costumes and playwrights, or the polish that troupes such as The Second City give to their carefully scripted works, it seems excessive to give the same rating to a quirky, bare-bones, late-night re-staging of a movie. So, while I hate to encourage all of those folks who don’t bother to read the reviews but just look at stars, I’m going to come down some for context’s sake. 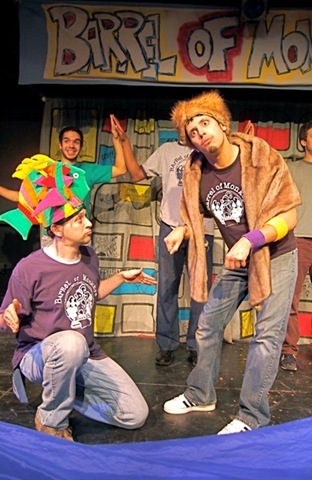 However, if you remember the 1980s, or at least "The Breakfast Club," this musical might be just your thing. Notes: Performances are at 10:30 p.m. Thursdays only. The second-floor theater has no wheelchair access. Paid parking is available in nearby lots.